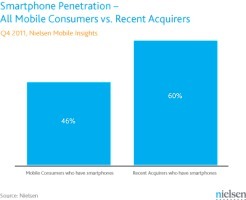 The analysts from Nielsen just published their report on the US smartphone market in the last quarter of 2011 and the numbers that it contains are hardly shocking. 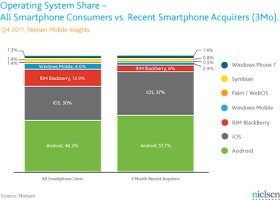 The iPhone 4S launch helped iOS gain a lot of ground and close the gap on Android. The two leading platforms were neck and neck in December, when most of the sales were generated. Windows Phone was the only other platform to improve its market position, but the Microsoft OS is still far from becoming a major factor in the US smartphone race. Android accounted for 51.7% of all smartphone purchases in Q4, but its share in November and December dropped to 48.7% and 46.9%, due to the strong iPhone sales. The Apple platform had a market share of 44.5% in December, which is nearly double what it had in October (25.1%). The overall iOS share for the quarter stood at 37%. Meanwhile, RIM continues its struggles and only managed a market share of 6% in the final quarter of the year. The Canadians had a share of 7.7% in October, but looking at the stats - it's all downhill from there. Windows Phone powered 1.4% of the smartphones sold in the Holiday quarter, which is an improvement compared to the 1.3% overall market share that it has. Another trend that Nielsen noticed is that more and more US citizens are switching to smartphones. 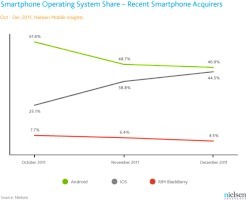 While just 46% of all users have a smartphone, 60% of those that got a new phone in Q4 opted for one with a proper OS.